Bring the taste of autumn to your seasonal menu with this delightful pumpkin spice cappuccino mix! When mixed with hot water, this drink powder produces a superb smooth consistency for a delicious cappuccino drink that your patrons will love. 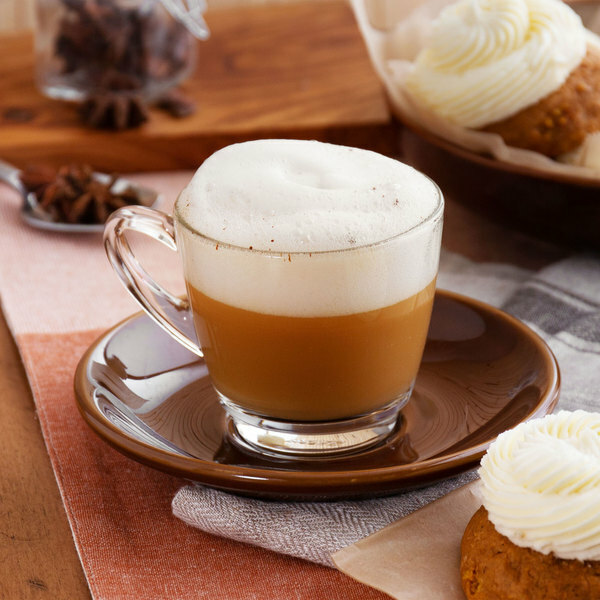 Reminiscent of fall-favorite treats, the beverage features the enticing aroma of pumpkin and warm spices. Top off the finished beverage with whipped cream and pumpkin pie spice for an extra special treat. 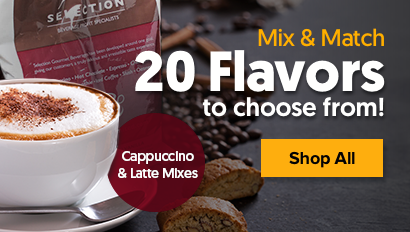 The perfect addition to any establishment, this cappuccino mix is sure to please patrons at your coffee shop, restaurant, concession stand, convenience store, waiting room, or lobby. Easy to make and great tasting, this pumpkin spice cappuccino mix allows your patrons to enjoy autumn flavors in any season! This pumpkin spice cappuccino mix comes with all the flavor and frothiness of decadent cafe drinks, without all of the time and effort. This easy-to-use mix delivers a consistent product each and every time. Each 2 lb. bag of mix yields approximately 29 (8 oz.) cups of cappuccino. Serve it alone, or use it to complement sweet desserts or breakfast pastries - no matter what you choose, this pumpkin spice mix will produce a cappuccino that is packed with flavor. For bulk preparation, follow the instructions on your cappuccino machine. For single servings or smaller portions, just add three teaspoons of powdered mix to 8 fl. oz. of hot water and stir until dissolved. Garnish with whipped cream and your favorite toppings or serve it straight. Each 2 lb. bag of mix yields approximately 29 (8 oz.) cups of cappuccino. Serve it alone, or use it to complement sweet desserts or breakfast pastries - no matter what you choose, this pumpkin spice mix will produce a cappuccino that is packed with flavor. We order these for our snack bar at our high school. Our kids really like the flavor from this mix. I would recommend using these to someone else. The photo thats posted shows a drink with a nice frothy head. Don't expect to get that unless you are going to froth your own milk. The mix will not froth up like that. Does taste good though. Obsessed with this pumpkin spice cappuccino! It’s full of flavor and so creamy. Just the right amount of flavor to get you ready for fall. The pumpkin spice cappuccino mix is a great quality mix and a lovely option during our harvest festival at our sweets shop. A terrific product and works great in our dispenser machine. The pumpkin spice mix is delicious and perfect for the fall harvest season. The mix is excellent quality and a top seller at our café. A nig big mug of pumpkin spice cappuccino, topped off wish me whipped cream and sprinkle a little bit of cinnamon on top. Or drizzle a little caramel on top of the whipped cream, and you're in heaven. Why have a slice of pumpkin pie and have to do all those dishes, when you can enjoy it in a cup with your favorite toppings , mmmmmmm !!! 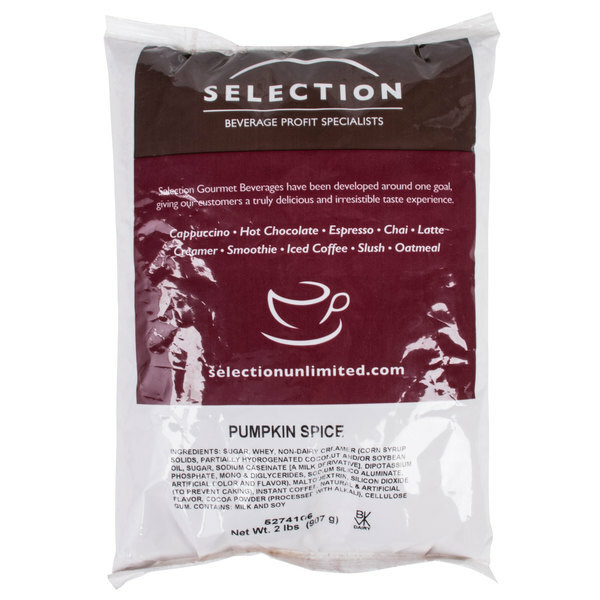 This is one of the better pumpkin spice cappuccino mix we have tried. The customers love it too. A very big seller in the fall. We will be buying this one again. This product went over very well during the Fall season. Taste was great and we didn't have any issues with compatibility with our machine. We actually were able to order from Webstaurant Store and get have in hand before our local food source company could get it. Highly recommend due to flavor. This pumpkin spice cappuccino mix tastes so good. And so easy to make. You only need to add hot water to 3 tablespoons of the mix, stir and voila! So good so delicious pumpkin spice cappuccino. It’s really amazing. We really like it. This is a great flavor for using seasonally. Add a little chocolate and you have a great pumpkin mocha. It's great for a change of flavor to keep customers interested. A great fall time flavor that takes our café by storm each year. The great seasonality of the pumpkin spice flavor lets guests anticipate its arrival. The blend of spices tastes great and its truly a fall classic. This pumpkin spice cappuccino mix packs tons of flavor. A few tablespoons of mix added to a cup of hot water makes for a yummy warm drink in the fall. I was really surprised at home much I liked this product. It was really good and we even added some of it to give our pumpkin pancakes, crepes, and waffles some extra oomph. Smells wonderful and blends smoothly,, just like you added straight pumpkin to the mix withthe spices,,, delicious with coffee our different milks,,will definitely order again!! Wonderful! Just what I've been looking for to serve for the fall. Ordering more and a new flavor to try. Whatever I'm looking for webstraurant has it! AWESOME! Rarely am I disappointed by anything in the flavor of pumpkin and this was no exception, which is to say I really like the taste. It comes in a pillow pack which I transferred into an airtight container in order to preserve freshness as the two pound size is going to last a while. Simply spoon the mix (amount to taste) into a mug, add hot water and stir. Simple and inexpensive alternative to the coffee shop. My customers are loving our new cappuccino machine, and the new pumpkin spice drink! Fall has arrived and it's a great time to enjoy a pumpkin spice cappuccino! A fall classic and must at my store. The customers love the different spices that make up this frothy cappuccino. Does well in the bunn imix machine and will definitely bring customers back or more. We have been enjoying these cappuccino drink mixed. This pumpkin one is a good one. It has a warm spicy flavor. It is good to have on a cold day. I usually don't like pumpkin spice flavoring, but I love this mix! The flavor isn't too overpowering, and it produces that great fall aroma when it's brewing! This isn't your typical pumpkin spice. The pumpkin flavor is subtle but delicious. It smells like fall and holidays all in one. I'm not s fan of anything "pumpkin" yet this was good! This has great pumpkin spice flavors, I am very happy with this flavor and it is nice that I can get it anytime of the year. I do not have to wait until fall! We buy this quit often seems like every one always comments on how well they like it, so great taste, best value for the money that is what I buy! This is a wonderful product with a great taste but does not mix well with the commercial machines and water we set out as a coffee addition and it went like mad we will be ordering more soon. Great seasonal item! Our customers love it when we serve it to them when they are shopping for the holidays. Tastes great, easy to serve! This cappuccino mix comes as close to the pumpkin spice flavor that you can get at some quick stop places such as gas stations. Good value! This is a great fall or holiday blend of cappuccino! It has a nice pumpkin spice flavor that is not too over powering! I like it with dessert!! Pumpkin Spice Powdered Cappuccino Mix is delicious, priced right, and not overly sweet. Easy to mix and flavorful. Makes a great addition to any coffee shop or cafe. This mix makes awesome pumpkin spice cappuccinos. What a great treat during the holidays. Now I can have it anytime. I keep this in an airtight container and mix it by the cup as needed, not in bulk amounts. Pumpkin spice is such a delish flavors, there's tangy taste but it's aromatic and makes you feel warm. I have never seen such a great price. When I ordered the Pumpkin Spice Powdered Cappuccino I did so on a gamble because it just seemed to sound like a good flavor. I certainly wasn't dissapointed! This stuff is really great! Good for all times of the day.